Sorry, I know this question has already been asked and answered in the forums, but I still can’t figure out how to get rid of 2.6 gigs of videos I shot but do not want to keep on the phone. They have been synced to iCloud (I think) and they exist on my iMac in iPhoto (confirmed). I just want these videos off my phone so I have more room for music. (Go easy with the jargon please, I’m just a hapless little old lady). Thank you. From the post above, we can learn that the iPhone user has saved her videos in the iCloud and iPhoto, so she can delete the videos from her iPhone without worrying the permanent loss of the videos. On a Mac computer, the iPhone users can take advantage of the iPhoto or Image Capture to delete the videos. Deleting videos from iPhone or iPad may not be simple to figure for most. There are actually three different methods you possibly can make use of based on the kind of video you would like to delete. Here’s how it’s done. 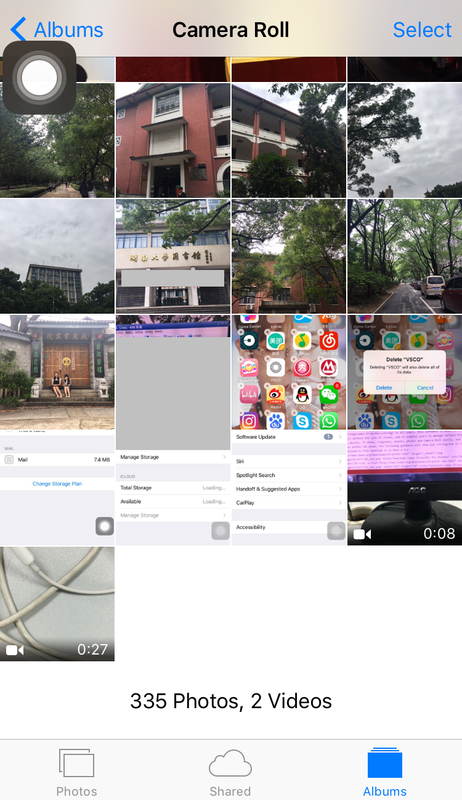 It is strange that the users are not able to remove videos from iPhone. If the videos are taken by iPhone, they will be allowed to be deleted in the iPhone Camera Roll, and the users only need to tap the names of the videos from right to left, then click the red “Delete” button. This is pretty easy to be done, but if the users get stuck in Camera Roll, they may have to reset their iPhone. If you are unfamiliar with iPhone, the steps below will help you. Open up the “Camera Roll” option to see the list of videos. On the list of videos shown on screen , Tap the video you wish to delete. click the trash can icon at the lower-right hand place of the screen. From that, Open the “Camera Roll”. And then tap “Select” from the upper-right of the screen. Tap the pictures and videos you would like to delete by tapping them. Resetting iPhone won’t lead to any data loss, so the users are able to reset their iPhone and see whether the functions of iPhone come back. To reset iPhone, users only need to hold the sleep/wake button and the home button at the same time until they see the Apple logo. Then their iPhone might go back to normal, and the videos in the Camera Roll can be deleted. 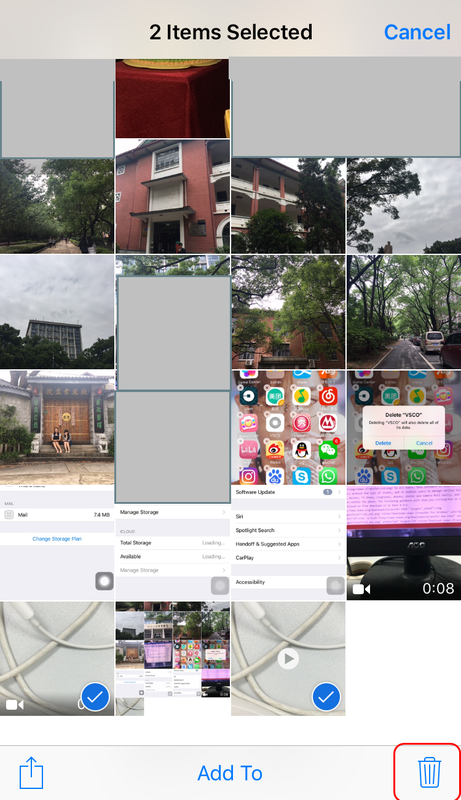 If the users have many videos in their iPhone, and want to delete them in batch, they can use the iPhone transfer software to accomplish the task. Leawo iTransfer will be helpful on this issue. The software enables users to transfer files among iOS device, iTunes and computers without the sync of iTunes, and it allows users to manage the files in their iOS devices with ease. The software also helps backup iPhone, iPad and iPod files to computer. The following guidance will show you how to delete videos from iPhone. You are allowed to free download the software to have a try, note that the trial version has limited transfer times. 1. Run Leawo iTransfer and connect iPhone to computer with the USB cable. The software will automatically detect your iPhone libraries, and then show the libraries in the left sidebar. 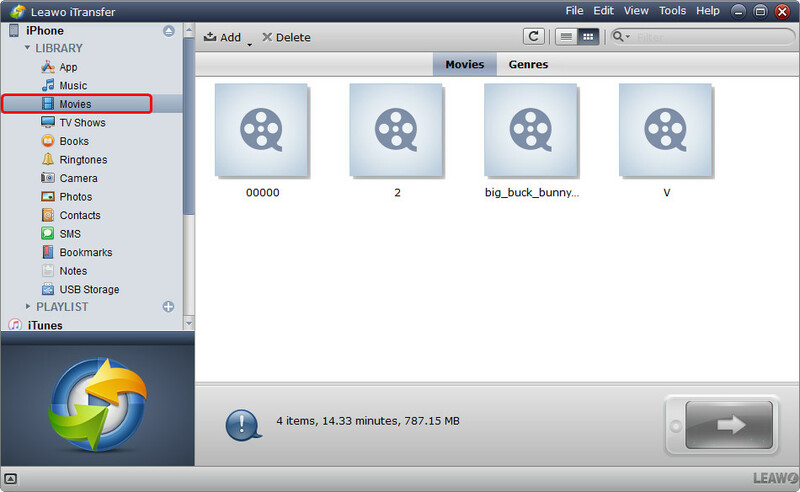 Choose “Camera Roll” or “Movies” library and then the contents will be show in the right part of the window. The photos and videos are lying in the window. 2. Hold “Ctrl” key and check the videos you want to delete, then right-click the chosen files and click “Delete” in the drop-down menu. The software will start deleting videos from iPhone. The progress bar in the pop-up dialog will show you the percentage of the deleting process. When the deletion is finished, you will get the videos deleted from your iPhone. 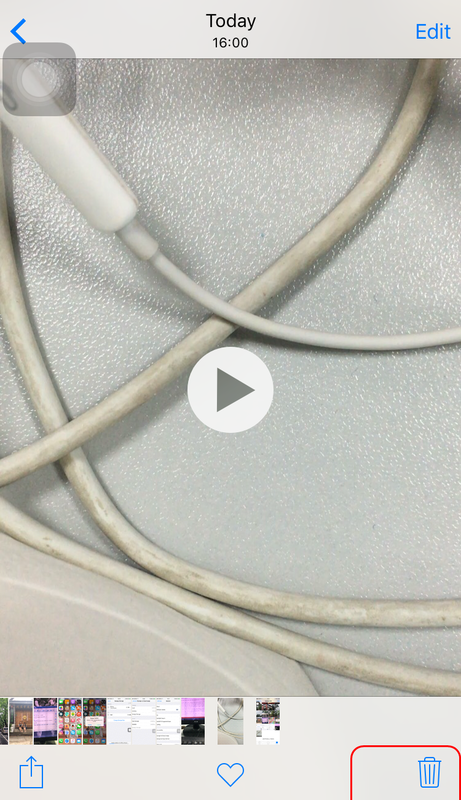 The third method recommended is to remove videos from iPhone via iTunes by connecting iPhone to computer with USB cable. As the official application released by Apple, iTunes allows iPhone users to download, transfer, backup and manage media files. 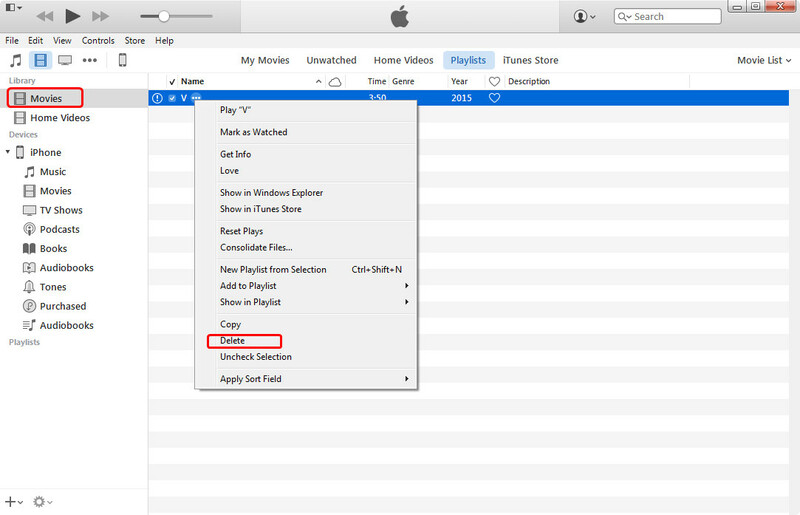 Following the guidance below to know how to delete videos from iPhone via iTunes. 1. Connect your iPhone to your computer and open iTunes. Then select the icon for your device in the upper-left corner of the screen. In the “Settings” section, select “Summary” on the left pane. 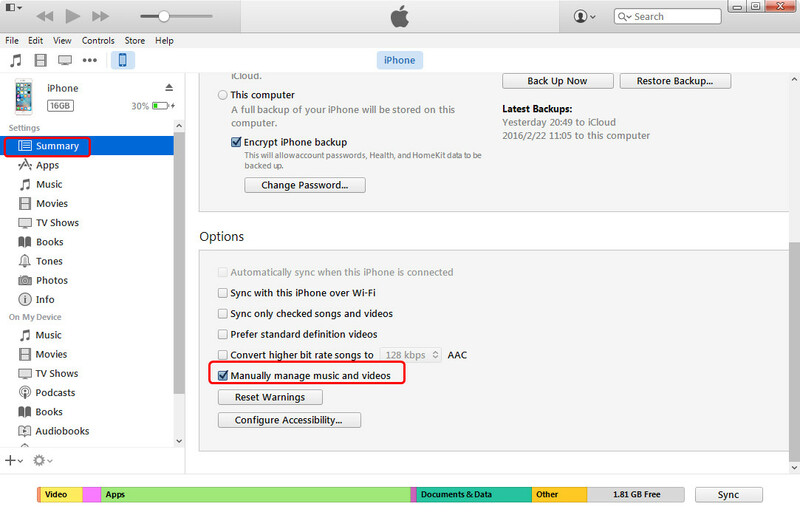 Check the “Manually manage music and videos” selection. 2. Select Movies tab from the left panel. The video that users want to delete can simply be right clicked. Select “Delete” option to remove the video. Then the video will be deleted from your iPhone. With the three methods mentioned above, you are able to remove videos from iPhone with not efforts, and Leawo iTransfer can also help back up those videos to computer. The software makes the data transfers of iOS devices easy to be done, and it fully supports various kinds of data transfers, for example, you can transfer ebooks from iPad to iPhone with the help of Leawo iTransfer. If you are interested in this software, just free download it and have a try.